(Nanowerk News) A recent study (JACS, "Nickel-Catalyzed Azide–Alkyne Cycloaddition To Access 1,5-Disubstituted 1,2,3-Triazoles in Air and Water"), affiliated with Ulsan National Institute of Science and Technology (UNIST) has presented a new way to advance the click chemistry. This is expected to be used in various areas, such as the synthetic chemistry of new drugs, development of functional high-molecules, and bio-imaging. In the study, the research team has introduced a new synthetic method to obtain a novel triazole structure, used for the production of drugs and high molecules. This breakthrough has gotten much attention as it is capable of producing triazoles using water as a solvent at room temperature, instead of using high-temperature organic solvent. This study has been led by Professor Sung You Hong in the School of Energy and Chemical Engineering at UNIST in collaboration with Dr. Gonçalo J. L. Bernardes' group at University of Cambridge, Professor Sebyung Kang in the School of Life Sciences, as well as Professor Jung-Min Kee, Professor Jan-Uwe Rohde and Professor Wonyoung Choe in the School of Natural Science at UNIST. The name triazole refers to any of the heterocyclic compounds with molecular fomula C2H3N3 that contain five atoms within the ring structure. The presence of three nitrogen hetero-atoms in five-membered ring systems defines the class of triazole. One of these is the 1,4-substituted 1,2,3-triazole compounds, a new synthetic method developed by Karl Barry Sharpless, the 2001 Nobel Prize Laureate in Chemistry and has been widely applied in various fields, such as pharmacology, biology, and materials science. The Huisgen 1,3-dipolar cycloaddition is a chemical reaction to access 1,2,3-triazoles, yet it suffers from the low regioselectivity. The Sharpless group demonstrated an elegant copper-catalyzed method to yield 1,4-disubstituted 1,2,3-triazoles in high yields under the mild conditions. The copper-catalyzed azide-alkyne cycloaddition (CuAAC) has become the key example of click chemistry and has been widely utilized in medicinal chemistry, biochemistry, polymer chemistry, and materials science. In 2005, the ruthenium-based chemistry to access complementary 1,5-disubstituted 1,2,3-triazoles was reported. Yet, the RuAAC is often sensitive to air and moisture and it requires elevated temperatures. 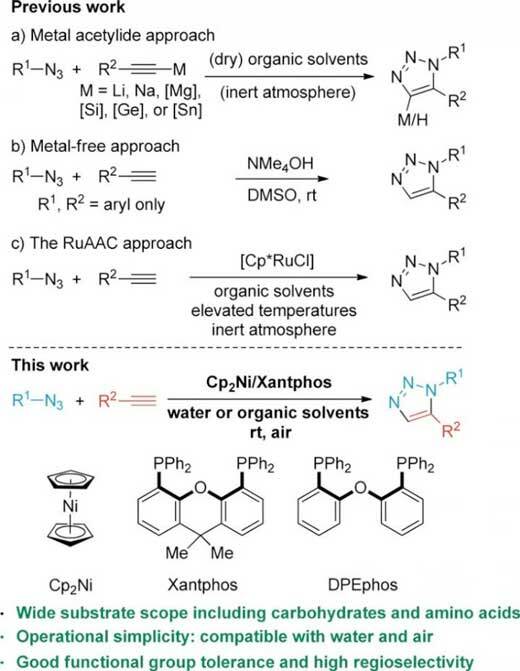 In the study, the research team reported nickel-catalyzed cycloaddition reaction to afford 1,5-disubstituted 1,2,3-triazoles. The reactions proceed in water and air at room temperature. Authors employed nickelocene precatalyst and Xantphos ligand to react the building units, an organic azide and an alkyne. "The NiAAC reaction is performed under the mild reaction conditions. Therefore this approach can be applied in various research fields including chemical biology and materials science," says Woo Gyum Kim in the Combined M.S/Ph.D. of Energy and Chemical Engineering, the first author of the study.